Gather together the 3 greatest engineering minds from the biking industry and ask them each to build the best drivetrain, and the result will be 3 virtually identical chain & derailleur systems. Obviously they can't think out of the box. It took the automotive industry almost a century of engineering to think outside of the box with transmissions. As fuel economy became critical continuously variable transmissions (CVT) became a focal point. While the internals of a CVT induce higher levels of drag then conventional designs they also allow the engine to operate at its most efficient zone. The NuVinci N360 is heavier and has more drag then a derailleur. But does the engine of a human being behave like an internal combustion engine where its more efficient at a specific speed? Only if you believe in pedaling cadence. Its a matter of elevating the scope of efficiency from the Unit level to a Systemic level. Fallbrook Technologies hit a Home Run with the N360. The N360 gives a wider range of gearing (360%) then most 10 speed derailleurs (300%). It still needs a front derailleur preferably a triple, and that still needs a tensioner. With a 26/39/52 up front, and a 20T sprocket in back, you'll get 720% or a Gear Inch range of 16.9-121.7 with a 26" tire. Under normal riding an N360 you'll put as much power to the rear wheel as a derailleur can. Up hills the N360 takes more energy, but having a wider (and lower) ratio the climbs will be easier, but slower. You'll never be in the wrong gear. Long distance riding (over 5 miles) on the N360 the rider will feel less fatigue and capable of longer rides. Your average speeds won't be any slower with the N360. On acceleration the N360 will be slightly slower then a derailleur, even more so for those who haven't truly learned the feel of dialing in the speed. The N360 will never need the rear derailleur adjusted. While the factory recommends not dropping below 1.8:1 that's intended for Hercules and Atlas. Lots of strong riders have run 1:1 ratios with thousands of trouble free riding. Moreover in the rare event a problem does occur, even years down the road, Nuvinci simply send you a new hub at no cost. The N360 gives the rider an incredible level of enhanced riding experience by allowing the perfect cadence at all times. Complete Nuvinci N360 kit professionally laced to a Velocity Aeroheat wheel is under $450. 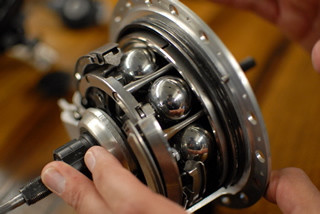 Nuvinci N360 has no gears instead it relies on tilting balls along with a very unique lubricant, a type of "semi-fluid". The entire system of cables, hub and shifter weighs 2540 grams (5 lbs 9.6 ounces). In contrast a typical hub, 10 speed derailleur, cassette, cables, and shifter weighs about 1200 grams (2 lbs, 10 ounces). To some adding 3 lbs to the hub is sacrilege. Worse its rotating weight, but since its at the center of the hub it doesn't seem to matter. The package is well sealed with very little seal friction. Some have been submerged in water with no long term issues. Zero maintenance, and rock solid. As close to "bomb-proof" as it gets. The chart gives a pretty accurate snapshot of efficiency levels found in the N360, Internal Gear Hubs (IGH), and a 10 speed derailleur for comparative purposes. No two test dynos ever give the same results on the same parts so take it with a grain of salt. What's important to consider is how often will you be riding at either end of an extreme of the range? Chances are over 50% of your pedaling is done at a ratio of .08 ~ 1.2. Contrary to what most folks claim, the N360 is pretty efficient in that range; more efficient then the typical IGH. Derailleurs are the most efficient however as sprockets get smaller and chainline moves off center it causes erratic changes in the efficiencies for each gear. IGH's suffer from drag as each gear is still meshing, just not engaged to the output shaft. More gears is more meshing losses. Ground gears can slightly reduce friction but comes at considerable cost. So with an added 3 lbs of weight and lower efficiency why would anyone want a Nuvinci N360? The answer is simple; for most recreational riders, the N360 makes engine more efficient. 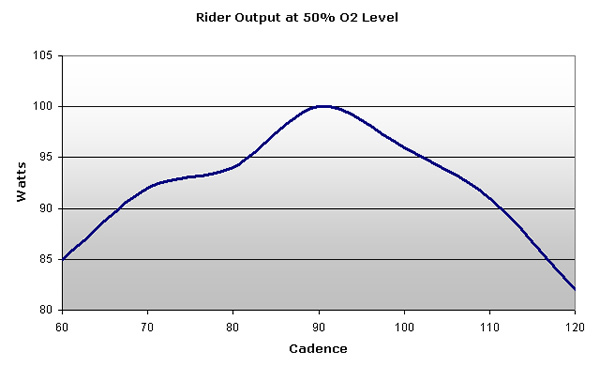 This chart is a typical example of how much power output (Watts) at various cadences while maintaining an oxygenation rate of 50% of their capacity. It is only a reference tool as different people will have slightly different cadences etc., but the overall shape of the curve will be the same. For the average sized recreational rider who rides 20-200 miles a week will produce the most power at about 90 RPM cadence. Whatever your peak cadence is (higher or lower) the same drop in power will occur as you go above or below your natural cadence point. You may not notice it because your body responds by giving you more oxygen. Keep up the off-cadence pace and you'll begin breathing harder. OK so a trained rider would say just change gears and true enough that will make a difference; sort of. Trikes tend to have wide gaps between gears. Most 10 speeds are about 14-16% steps; so even if you're in that ideal half step of 7%, you still drop about 3-4 watts of human efficiency. That's where the difference is; what you lose in drivetrain efficiency over a derailleur, you gain back in human efficiency. The dyno motor doesn't care about cadence. Its got just about the same efficiency at low speeds as it does at high speeds. Where the N360 really shines bright is when two riders can't ever seem to run exactly the same pace that gives them their ideal cadence. Most couples who ride together find the N360 to be the perfect solution to achieving their perfect cadences. Systemic results are the combination of how the drivetrain and the human engine work together. Beyond the percentages and watts is the almost natural sense of fluidity in maintaining exactly the right cadence at all times. First time N360 riders think that after a few minutes "I got it". Well they may understand how it works, but it takes 100 or more miles before constant micro adjustments become second nature. You don't think about it at all, you just do it. The best part is the N360 trained rider takes on a new sense of anticipation of climbs and descents. You'll never be in a position where you wish you had gone to a lower gear on the cassette as you climb a hill; just keep on the power and wind the ratio higher as needed. Wide ratio cassettes found on most trikes don't shift nearly as well as close ratio cassettes on road bikes. The bigger the leap is for the chain, the harder it is to jump sprockets. Most folks who convert from a derailleur to an N360 begin to realize that they often were climbing short hills in the wrong gear; mashing their way up the hills. Fallbrook recommends the lowest ratio of 1.8:1 with an upper power assist limit of 250 watts. That's kind of confusing for those looking to mount an N360 on a trike with no power assist. Moreover not everyone really understands what the 1.8:1 really means. Keep in mind, that's for an upright bike with 180mm long cranks and 250 watts of power assist, with an athletic clydesdale rider. On an upright like a MTN bike the rider alone produces a 250 lbs force and with a 180mm crank length the torque on the crank axle comes out to 1771 inch-lbs. Regardless of the chainring hub sprocket sizes the ratio of 1.8: is the limit; therefore 1771 inch-lbs / 1.8 = 984 inch-lbs. And that's before adding a 250 Watt motor. Note disclaimer here - Fallbrook does not derate the N360 for use on Recumbents or rider strengths, or crank lengths. If you choose to run at a lower ratio then 1.8:1 it is at your own risk. This information is provided only to give an example of what other riders have tried and had no long term issues with. The best option is pair the N360 with a triple front. Most riders will want a wider ratio then 360%. 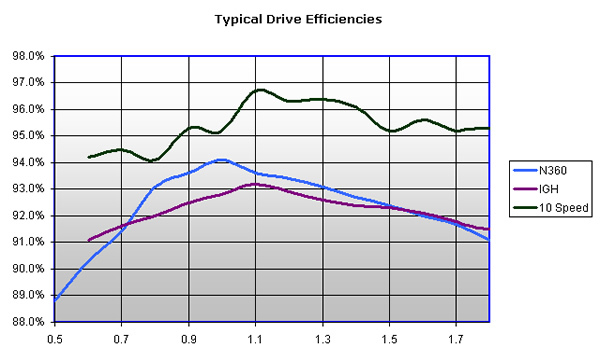 Also as the efficiency graph from above shows the N360 efficiency does drop rather quickly from 0.8 to 0.5; that doesn't make it unusable in that range, but those a keen sense of drag will notice it very slightly. Its that lower range drag that seems to immediately turn off the more sensitive weight weenies to the N360. Triple rings take up the most chain slack so you'll still need a tensioner of some form with two jockey wheels. For example, with a 52T high and 26T granny there is about 5.75" of chain slack to take up. There are some decent tensioners on the market usually in the $40-$60 range, but a better option may be to use an existing derailleur that has longer H/L limit screws installed to fix the chainline. In fact there are several Shimano 6-8 speed derailleurs available for under $25 that have larger diameter jockey wheels (more efficient). The Gearmaster.XLS file has formulas that calculate gearing options within the limits that have been tried & tested with no long-term failures.